During the installation it said that it was all "okay" or something.. But suppose that it isnt installed at all, how can i install it properly? Also tried to reinstall the acer driver but withouth anny positive effect. It doesnt work for me..
went fine. Till i tried to install a custom rom. exclamation point, also tried opening recovery via quickboot. But the app closes when i hit recovery. Anyone knows what went wrong? 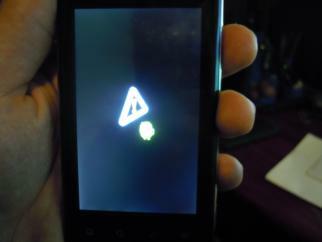 But when I use adb commend "adb reboot recovery",it can enter CMW successfully. Whats wrong with key combo? How do you root it without enter recovery to install superuser? Shell needs root to restart into recovery right? It's over 1 GB in size!!! I have a 16 gb microsd, fat32 formatted, no ext or so. Was there any problem with v2.2 or is there any need of v3.0? How long should it take? Since 20 minutes I have "fastboot: download;00448000" message on Acer screen and "sending 'recovery '" on process window ... any advices? edited: instead of making combos I use Superoboot, seems to be much easier. I have an error page opening the recovery..why?? I've tried to install recovery 2 times..but nothing, the same error..
i've resolved..is possible that using vol up + vol down + focus (camera) + ON i have this error and with vol up + focus (camera) + ON the recovery work perfectly? What to do? Happend to me with the 2.0 2.2 and 3.0. It's becoming a nightmare!. I can't install it, installation process tell me that there are too many links, what shall I do? Answer please. Thanks vache for your good work. Actually I've the 2.2 version of your recovery and i will install 3.0.
this recovery doesn't support sd-ext at the moment, it's a bug. Hi guys, I feel so stupid.....I put the latest CWM recovery on from the market, v4 something, and I can't get this one back. Everytime I boot into recovery it keeps coming up with the v4 one. How do I get rid of it and put this v3 one on ? In 2.2 is the + ext option meaning it will back up the link2sd partition on your SD card or something else? In other words it it a useless option if you don't have ext on your SD card? Yep it backs up the Link2SD partition. Ah thanks so I was fully backing my phone up all a long (I didn't have links2SD at the time). I thought someone said it would backup ext partitions on the phone, I was mistaken.